In this little corner of the world I get lost in creativity; a craft project, an article or just in thought. Bags in a reasonable amount of time. representing the holiday accompanied by an ink pad of desired color. the plastic box and 1 stick go gum on each of the sides. - be sure that gum stick bottoms are flush with the bottom of the tic tax box. - secure ribbon close to the upper and lower edges of the gum sticks to create an attractive border. - measure and cut card stock to fit in between the top and bottom ribbon borders. - stamp image onto the paper. 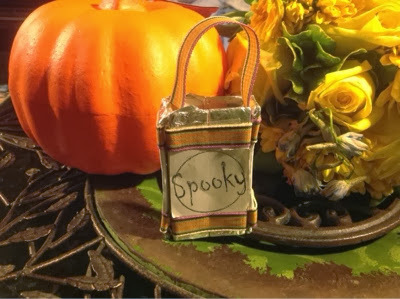 - secure paper to the front of the trick or treat bags between the ribbon borders. 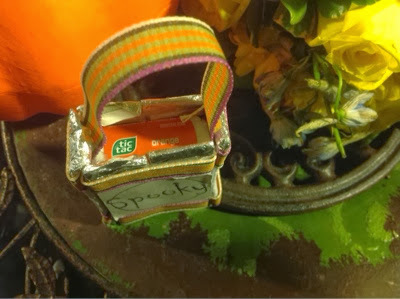 To sweeten up this project more, add small candies to the inside the top of these Halloween bags. I love to Link up to Link parties, like the ones below! Thanks for stopping by! Gals you found me I 'm following ya back! It makes me smile when comments are left. I know others love comments as much as I do, so I always like to return the favor! Originally a New Yorker, now a Carolina Girl! I am truely blessed with a wonderful husband and family. Being creative is in my genes and I love every minute of it! I hope to share creative ideas with others as well as inspire and be inspired!